Basketball NI utilises a government organisation, known as AccessNI, to operate and manage a criminal history disclosure service. This service supplies criminal history information about job applicants, volunteers and employees. More information can be found about them here. For those working with children or vulnerable adults Basketball NI insist upon a check. AccessNI searches details against UK criminal records and police information. Once the search has been completed AccessNI produces a disclosure certificate which is posted to the individual that has been checked as evidence of the check being undertaken. Note that a conviction or caution does not necessarily impede an individual’s future in the game; each situation is considered in relation to the individual circumstances. The application will take about 15 minutes. The application will be reviewed and processed normally within 14 days and a certificate will then be printed and dispatched from AccessNI within a further 4 days. The video below offers a quick overview of how to fill in and submit the application. This form: PIN NOTIFICATION AND ID VALIDATION FORM (in Microsoft Word format). 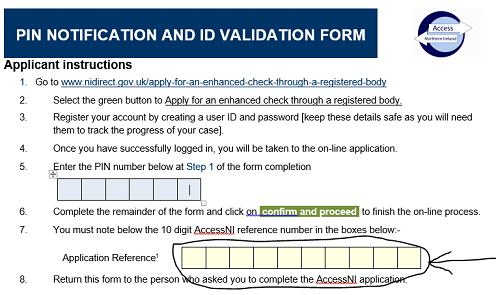 Go to the AccessNI website and select the green button to Apply for an enhanced check through a registered body. Register your account by creating a user ID and password [keep these details safe as you will need them to track the progress of your case]. This PDF file, has been created by AccessNI and gives some more detail with screen shots. On the final screen (step 12 of the online form) you will see a 10 digit AccessNI reference number. Copy that number down on your “PIN NOTIFICATION AND ID VALIDATION FORM” (see image below for reference). Insert 10 digit number here. The online part of the process is now completed. Take your “PIN NOTIFICATION AND ID VALIDATION FORM” and have a club representative such as the Chairman, Secretary or Safeguarding Officer or another professional 3rd party such as your GP should complete the remainder of the form. 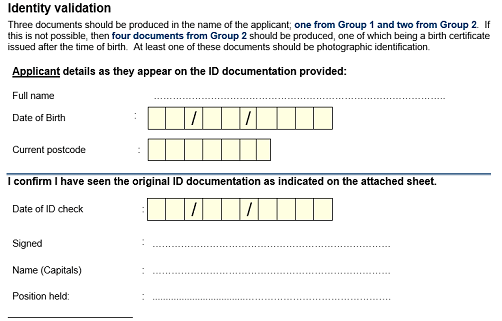 This person must verify that they have seen the required forms of identification (ticking the ones have been produced) before signing the document. This section must be completed by a third party. After you complete your application forward it to us [Basketball NI, 2a Upper Malone Road, Belfast BT9 5LA] for approval. We will then review and pass the application to AccessNI for processing. You will be able to track its progress by logging into your account or by using the link included in the confirmation email you will receive.